In preparation for the launch of CMC’s mobile game designed to educate more consumers on cranberry’s effect on Gastroenteritis, MZMC organized a campaign on Weibo, between March 7 and 11, in collaboration with SINA. Its objective was to increase the number of followers of CMC’s official Weibo account. This Weibo campaign’s theme was built around introducing cranberries, using the key word #U.S. Cranberry# and linking it to the online mobile game ‘Stomach Protection by U.S. Cranberries’. SINA invited 19 key opinion leaders (KOL), with a total of 42.05 million followers, to post Weibo contents, in order to generate wide spread discussions among the public and other KOLs. The 19 posts received 3.11 million impressions and a total of 43,904 reposts, comments and likes. In additional, CMC enlisted its own media contacts and KOLs to post and repost Weibo contents about cranberry. CMC also reposted these contents. The combined efforts generated more reposts, comments and likes. On March 8, a banner with key word #U.S. Cranberry# was inserted as one of the hot topics on Weibo’s homepage. The banner was linked to the CMC landing page. The followers of CMC official Weibo account reached 38,774 as of March 11, an increase of 19,350 or nearly 100% compared to the level prior to the campaign. 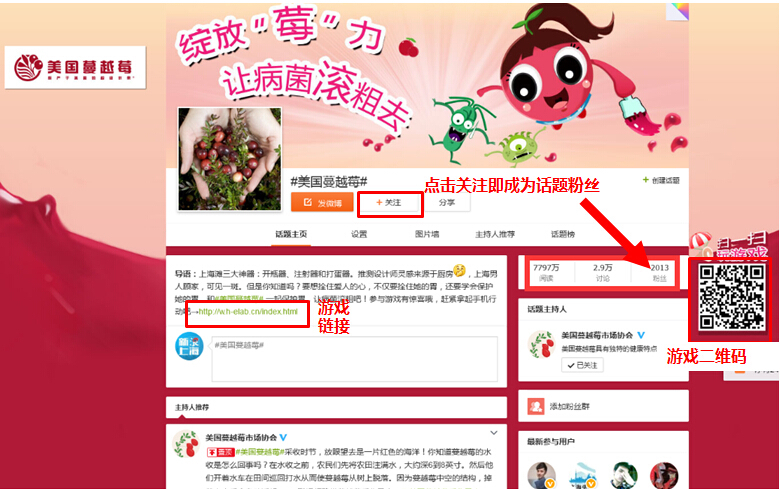 20,482 Weibo users visited the cranberry mobile game page and got exposed to the message about cranberry’s anti-adhesion effect and stomach protection. SINA is an online media company serving China and the global Chinese communities. Its digital media network of SINA.com (portal), SINAa.cn (mobile portal) and Weibo.com (social media), enable Internet users to access professional media and user generated content (“UGC”) in multi-media formats from the web and mobile devices, and share their interests with friends and acquaintances.